Last edited by TheHotHead; 12-04-2013 at 09:19 PM. Last edited by Locoevo; 12-04-2013 at 09:56 PM. I'll do something similar to that as I can't destroy all rocks & trees because im going for the castle so i'll make something decent and once im finished I can re-do it all. Upgrading both of my gold storages at the moment. Both have about and hour and a half to go so im just hoarding coins and elixir until then. How do you take a screen shot on the iPad? I did something like that .. Took a it but finally got a pic.. Here is mine.. Have a long way to go..
Well, I just destroyed the guy who attacked me so now he has a 16 or 20 hour shield and lost a decent amount of elixir and gold. God bless those sneaky goblins :') Okay so as I typed this, I got attacked and my new defense pummeled them. Loco, +rep for saving my hide sir! That's actually a good looking base you got there but put the townhall somewhere else because there isn't any need to protect it. 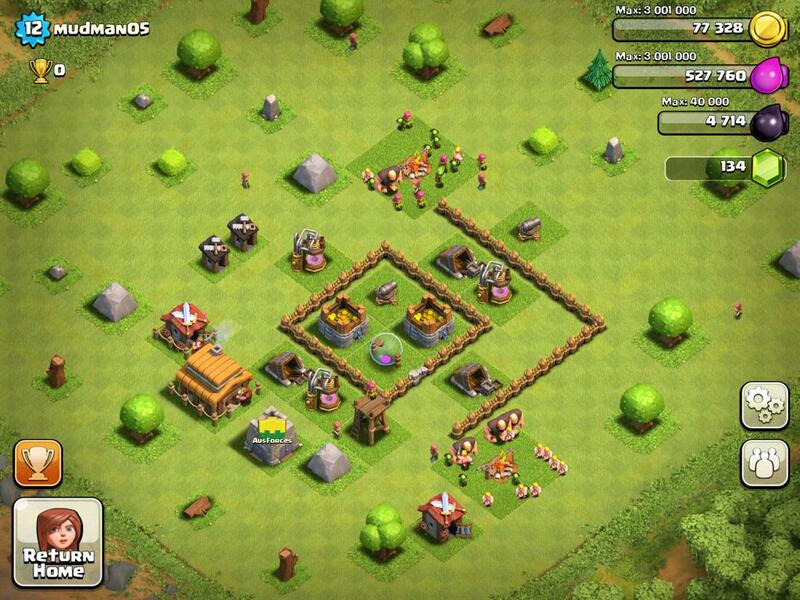 Put your mines and collectors where your townhall is. 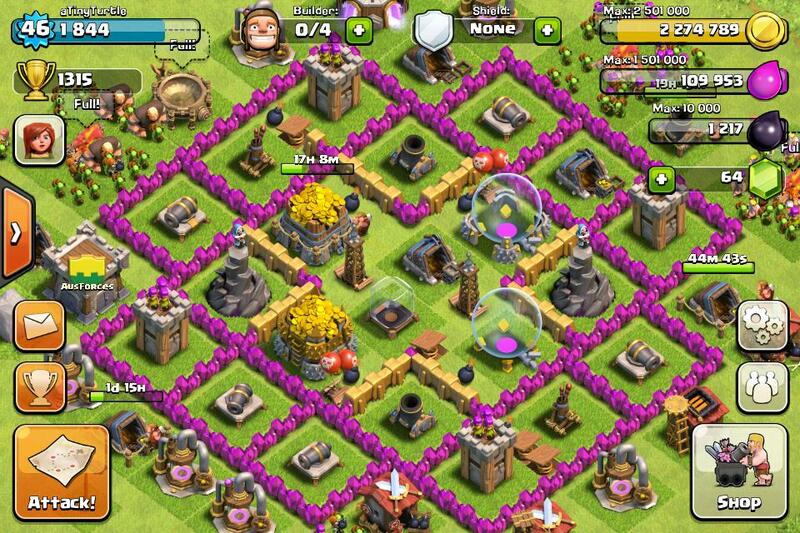 Looks good Des, but like Rad said put the town hall outside your walls, it gives people the chance to attack it, once it's destroyed you get an automatic Shield which will give you 12 hours of down time where no one can attack you, thus giving your gold mines and elixir pumps time to accumulate more stuff. I love symmetrical bases, i would probably avoid yours if i didn't have any wall breakers. Good to hear mate, if anyone else wants base tips just post up pics of what it looks like now and we can help design your bases. Though i must admit building up bases is a large part of the fun for me, literally wasted hours of my life building different bases. I have in place 3 mines and 3 elixir pumps.. I'll just work on now getting the require coinage to join the clan.. Which at my rate will be sometime around 3.00 am Tuesday morning..
Just move that Town Hall out from behind the walls Des, maybe put your elixir pumps in its place. When something is upgrading it's basically rendered useless you'll discover this later on with defensive buildings. Last edited by mudman05; 13-04-2013 at 10:05 AM. Will do when I get home if no one else has. At work atm. do it on ur lunch break!! i only work 4 hours on a Saturday, i'll be going home during my lunch break which means i can do it then, plus i don't have an iphone only an ipad which i leave at home. Now the fun part starts, get to go raid other villages and steal heaps of gold elixir. Tap your castle mudders and select 'request troops'. Thats a pretty good setup Arctic. ImageUploadedByAUF Forums1365837216.157237.jpg So any feedback or tips/changes that you guys recommend before my shield drops ? Think It should just about hold off, for a few fights anyway.. Let me know your thoughts boys and girls . Just swap your town hall with your gold mines and that would work a bit better. Looks great RT, need to spread your cannons out & is the Giant Salamander a DLC? I think I need one. Last edited by mudman05; 13-04-2013 at 06:57 PM. Just put that cannon on the right behind a wall muddy and its good. This one is for muddy. The things you don't have are down the bottom. once you get more stuff i'll change it to suit if you like. Last edited by Locoevo; 14-04-2013 at 07:14 AM.